MANILA — Indigenous leaders from mining-affected communities had submitted a petition to lawmakers calling for the repeal of the Mining Act of 1995. The Scrap the Mining Act Network and indigenous peoples led by the Kalipunan ng mga Katutubong Mamamayan ng Pilipinas (KAMP) gave the petition on August 11 to North Cotabato Rep. Nancy Catamco and Bayan Muna partylist Rep. Carlos Zarate. Catamco, a Manobo, heads the House Committee on National Cultural Communities. 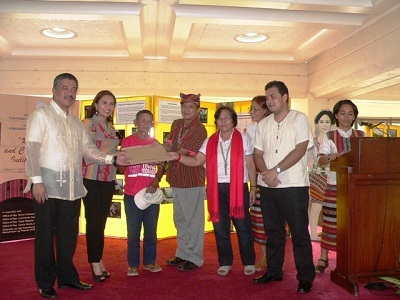 Leaders from the Igorot, Ayta and B’laan communities handed over the petition during the program for the opening of a photo exhibit at the North Wing lobby at the House of Representatives in celebration of the World Indigenous Peoples day. Malayao said the Mining Act of 1995 or Republic Act 7942, has been widely criticized by indigenous peoples, environmentalists and church people. “The Mining Act of 1995 opened the floodgates for mining projects in ancestral lands, consequently threatening not only the land and resources, but the survival of indigenous communities all over the country,” she said. Malayao said that although the petition does not endorse a particular mining bill, it calls for the enactment of a “pro-Filipino people mining bill.” If Congress passes a new law, the Mining Act is implicitly repealed, she said. Two proposals for a new mining law have been re-filed after having reached only up to the committee level in the 15th Congress. The two bills — the People’s Mining bill authored by Bayan Muna lawmakers and the Alternative Minerals Management bill authored by Ifugao lawmaker Teddy Baguilat. Zarate said the two bills have been submitted to a technical working group (TWG) “to be harmonized.” He said that the TWG has met for only a few sessions and is waiting for the proposed version from Malacañang. Based on the data gathered by KAMP, government had approved 712 mining applications covering 967,530 hectares all over the country. Of these, 251 applications cover 532,368 hectares – or 51 percent of the total land area approved for mining – which are occupied by indigenous communities. In its petition, the Scrap the Mining Act Network cited how the Mining Act allows 100 per cent ownership of mineral lands by mining companies through the Financial and Technical Assistance Agreement, giving companies rights to all the resources found in the mining tenements, including the bodies of water and the forest cover. The petition also noted that the Mining Act grants bigger tax benefits to transnational companies compared to those given to Filipino entrepreneurs. In March, in the 19th year of the Mining Act, indigenous peoples, peasants, environmentalists and scientists protested against the environmental destruction, land-grabbing, displacement and human rights violations brought about by mining liberalization. “We have high hopes in this campaign because we know that our awareness-building is being replicated by those we reach in the communities. The additional support from those inside Congress will be a big boost to the efforts in the grassroots level,” Malayao said. The petition was launched on June 4 this year and has gathered the signatures of 120 personalities representing some 60 institutions, including churches. Among the signatories were: National Artist Bienvenido Lumbera, Caloocan City Bishop Deogracias Yñiguez, Bacolod Bishop Vicente Navarra, actress and women’s rights advocate Monique Wilson, Missionary Benedictine Sisters Prioress Mo. Adelaida Yrugbay, Caloocan Bishop Emeritus Jose Manguiran, Our Mother of Perpetual Help National Shrine (Baclaran church) Rector Fr. Victorino Cueto, University of the Philippines Student Regent Neill Macuja. Malayao said they will continue to gather signatures in churches, schools and other public places. “The petition will serve as push to oppose mining, by gathering support from the people, not just among those in the communities directly affected by mining, but also from the rest of the citizenry who suffer from the worsening economy and plunder of the national patrimony,” Malayao said. Catamco, who spoke at the opening of the photo exhibit, said: “We may speak different languages as indigenous peoples, but we have the same reason to be here. It’s always right to fight for indigenous peoples’ rights,” she said. 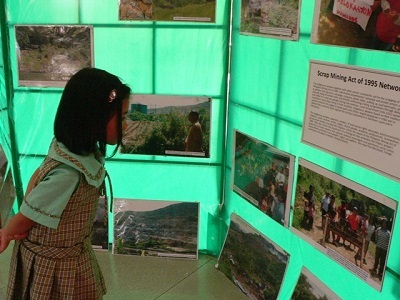 The photo exhibit, which had the theme “Reaching out and converging with the indigenous peoples” was put up by KAMP in coordination with the offices of Zarate, Catamco, Baguilat, and Gabriela Women’s Partylist Luzviminda Ilagan. The exhibit, which aims to reach out to employees and lawmakers, will be open for this week.